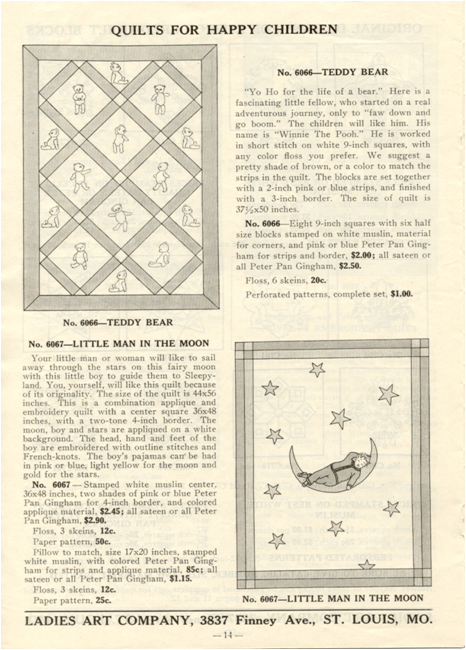 Around 1912 Ladies Art Company (or LAC) added quilt kits to its repertoire of catalog items. Some of the oversized supplemental catalogs, Perforated Patterns for All Stamping Purposes; Supplement of New Designs, listed quilt kits for sale with their other perforated patterns. Several different styles were offered for your convenience. One could buy the quilt kit pattern alone, or the pattern and the fabric, or the fabric with the pattern already stamped on it. Bleached or unbleached muslin ‘lining’ (backing) fabric, cotton wadding (batting), and embroidery floss could be bought separate from the kit pattern. 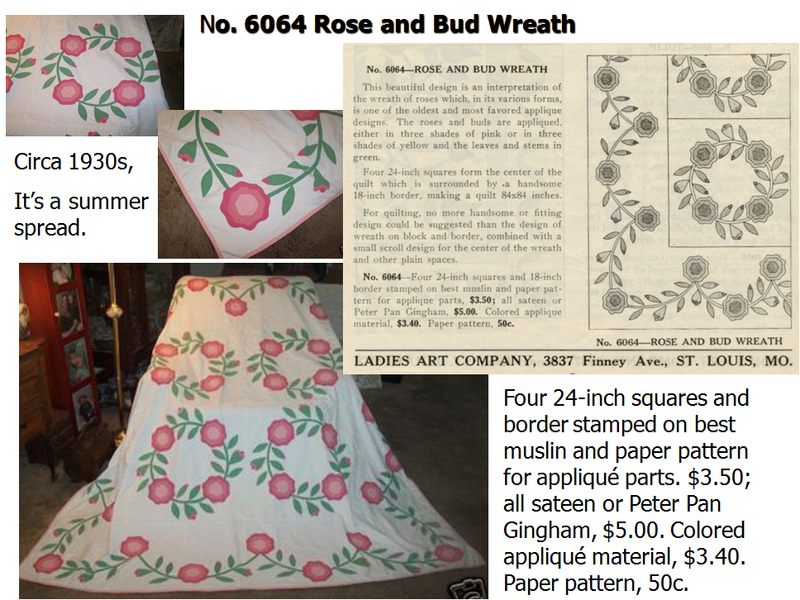 Bedspread patterns with matching curtains, valances, bolsters, and vanity or dresser scarfs were also for sale. 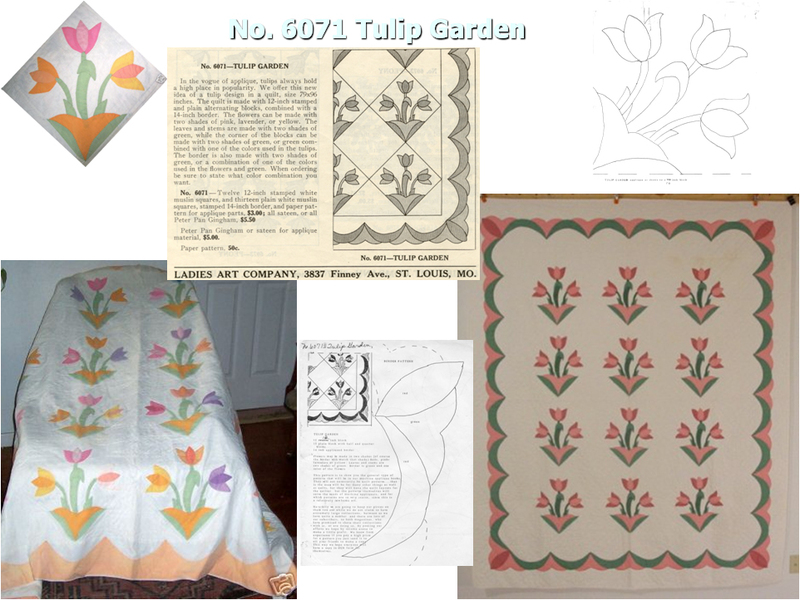 Ladies Art Company sold quilt kits in several different types of needlework. Blocks were sold, and could be alternated with plain blocks. The quilt kits could be made up in Patchwork, Appliqué, Cross Stitch, Embroidery, or Candlewick. For example, “Bedspreads No. 2825 and 2850 are quilted spreads.” “Directions and color chart sent with every order. The quilted spreads are made in one size only, 72 x 90 inches, as this type of spread is most appropriately used in the narrow width and shorter length. Scarfs, curtains, pillows, and vanities are not quilted with lining and wadding, but simply worked in a coarse running or darning stitch. The bedspreads may also be worked in this fashion if a quilted spread is not desired.”(1) A coarse running or darning stitch’ is an unusual description of an embroidery stitch. Was this the embroidery stitch known as ‘the Depression Stitch” in later years? (1)Ladies Art Company, Needlework and Supply Company catalog, page 4. (2) Benberry, Cuesta. 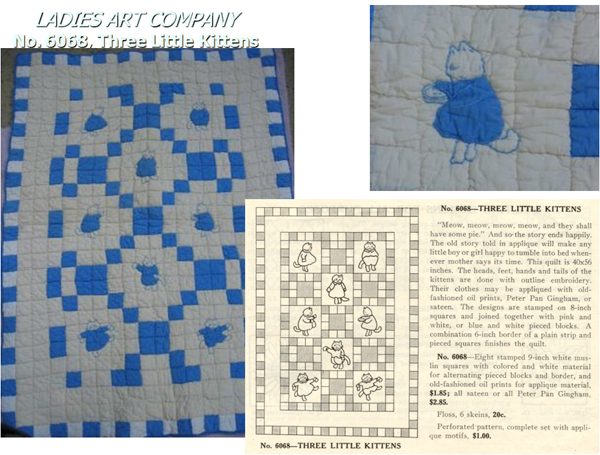 “Quilt Kits — Present and Past, Part II”, Nimble Needle Treasures Magazine (OK) v.6 no.4 1974:1.